Our secure caravan storage site is designed to safely accommodate todays large & costly leisure vehicles & to give flexibility to owners who can collect & deliver with ease . We offer caravan storage for as little as £10.00 per week. Each parking bay is generous in size for easy manoeuvring & can be self-accessed 24/7 365 days a year. Once you are allocated a storage/parking bay this is yours for as long as you stay with us. We will not move your caravan. Fully enclosed security fencing and & brick boundary fencing. Controlled security gate operated by individual swipe cards. 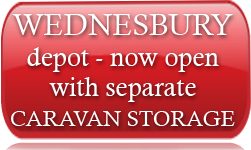 For more information on our caravan storage services covering the Wednesbury area call NOW on 0121 505 2378 anytime day or night, and we will be pleased to give you a competitive quote.